Dont worry if you are new to Email Marketing it really is quiet simple once you get the hang of it and we will help you every step of the way with our free UK based support line. We also offer FREE in house training at our offices in Lytham in Lancashire every month should you wish to come along and join us so don’t worry. 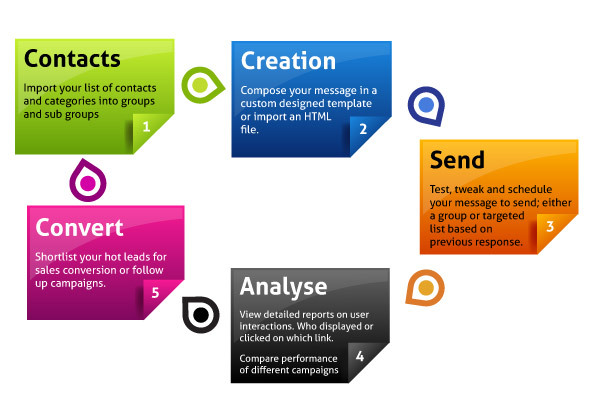 Basically we have developed some very accurate software that makes sending and monitoring your email campaigns extremely easy. Our easy to use admin system allows you to manage every aspect of an email campaign, from building a list and creating personalised newsletters, to measuring campaign results and sending automated follow up emails. The admin system is completely web-based - no software to download or install on your system. Everything runs directly from your web browser, meaning that you have 24/7 access to your account and stats from any computer, ipad, tablet or mobile phone with a browser and an Internet connection. We also take all of the headache out of the design work for you. Every new client is entitled to a FREE custom designed template for you to use for your campaigns, this is uploaded by us to your Admin area. This bespoke template will be designed to match your website or business identity by our highly skilled team of Graphic Designers. All you then need to do is log in and edit the template with your own words and pictures so its all ready to send out to your clients. If you require additional templates then these can be purchased from as little as £40.00+vat just let us know. Need help creating or growing your email marketing lists? No problem we have several marketing strategies and ideas that we will gladly share with you, as mentioned above we really are here to help you.